I mixed equal amounts of milk and half-and-half, but you can substitute with heavy cream, full-fat milk, or your own blend if you wish. Serves 4 to 6. Pour one cup of milk into small a saucepan. Sprinkle half the gelatin -- about 1 teaspoon -- over milk and let sit for 5 minutes. Warm milk and 1/2 of gelatin over low heat, stirring to dissolve completely. Add 1/2 cup of milk, 3/4 cup of half-and-half, and 2 tablespoons sugar, stirring, over medium heat until mixture begins to steam. Remove from heat and thoroughly stir in chocolate pieces. Pour mixture through a fine-mesh sieve into a bowl. Divide chocolate mixture among 4 to 6 glasses. Refrigerate for 4 hours. Combine remaining 3/4 cup milk and 3/4 cup half-and-half in another saucepan and heat, stirring, until mixture begins to steam. 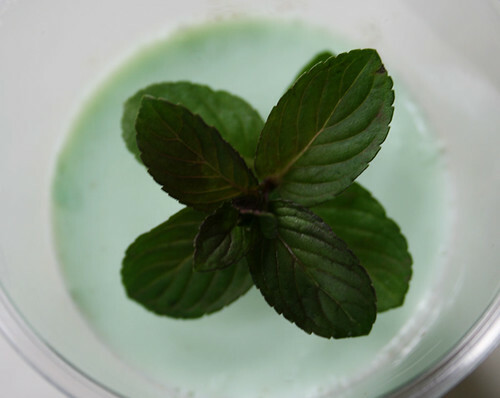 Add mint leaves and let steep in refrigerator while chocolate layer sets. Once chocolate layer is nearly set, strain mint mixture into a saucepan. Sprinkle remaining gelatin on top and let sit for 5 minutes. Then add remaining 2 tablespoons of sugar and warm, stirring, over medium heat until mixture begins to steam. Stir in green food coloring, if using. Let cool in pan for 40 to 60 minutes. When cooled to room temperature, pour mint mixture evenly over chocolate layer and chill for four hours. Garnish, if desired, with mint sprigs, chocolate shavings, chocolate chips, or whipped cream.